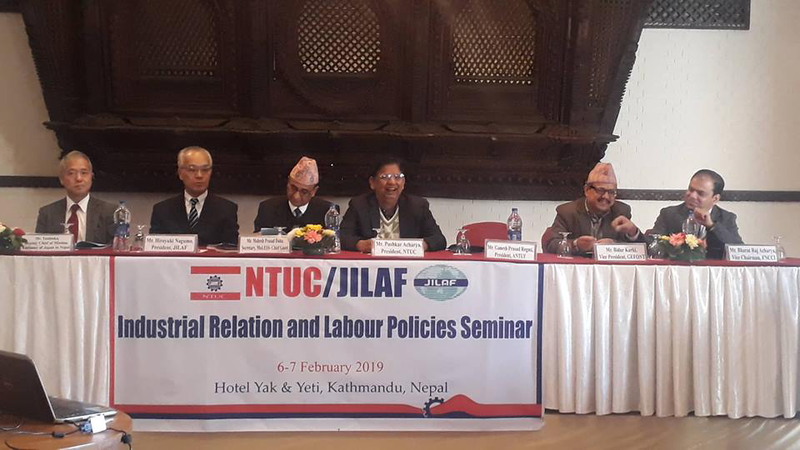 February 6, 2019, Kathmandu: Nepal Trade Union Congress and Japan International Labour Foundation held one day Industrial Relation and Labour Policy at Kathamdnu Nepal. Representatives and workers from Nepal Trade Union Congress(NTUC), General Federation of Nepalese Trade Union(GEFONT), All Nepal Trade Union Federation(ANTUF), Ministry of Labour, Employment and Social Security, Japan International Labour Fundation, Japanes Embassy to Nepal were present during the program. President of NTUC Brother Pushkar Acharya told that government of Nepal must promote employment inside the nation rather than depending the economy on remittance. Every sector must practice good insutrial relation and government have to be keen on implementing the realted understanding and laws, he added. Furthermore, Secretary to Ministry of Labour, Employment and Social Security Mr. Mahesh Prasad Dahal inaugurated the program and said that Industrial Relation in Nepal is the one of the best practice among South Asia. Insutrial harmony, increase in productivity only can be gained if there is good industrial relation. In order to cultivate that Government of Nepal have formed Tripartite representation in Central Labour Advisory Committee, Minimum wage determining Board including the participants from Trade Unions, Employers Association. These has helped to reduce the conflict and if occured can be sort out by immediate discussion. Also, These kind out facility will be soon open in the province level as well. President of JILAF Mr. Hiroyuki Nagumo briefed that JILAF has been conducting Projects and free informal school in Nepal as well as underdeveloping countries for trade union development, labour rights, industrial relation, Likewise, Vice Chairman of Japanes embassy to Nepal Mr. Yoshika stressed that ther are many labour from informal sector and new labour act 2075 have not covered prior of these sectors. Similarly, Vice president of FNCCI Mr. Bharat Acharya urge that productivity only increses if there is sound industrial relation. Moreover, Vice president GEFONT Mr. Bidur Karki vouched that Nepal doesnot have too bad industrial relation and if every previous understanding is implemented than we can have sound industrial relatino. Also, General Secretary of NTUC Bro. Yogendra Kumar Kunwar expressed that unemployment is the main problem of the country and job creation must be the main agenda of the nation. Everyone must take the responsibility of Productivity, Sound industrial relation. The program was presented by NTUC Deputy General Secretary Brother Ganesh K.C. The program went from 8:30 am to 5 pm where presentation regarding collective bargaining, Industrial Relation and Labour policy also took place.